SmartSync® Product Catalog-SmartSync® DCS Bandwidth Efficient Reliable Secure Data Distribution Solutions – Ironhawk Technologies, Inc.
SmartSync® DCS Server provides bandwidth-efficient data distribution using DCS Protocol (over HTTPS, WSS, UDP, ...) with WAN-side SmartSync® Client, Peer, and Server nodes. Standard Edition features include the concurrent sending and receiving of data from remote nodes, drop folders for easy and automatic shipping of files, and a web browser based user-interface. Professional Edition has all Standard Edition features with the addition of priority-based bandwidth allocation for data transfers, bandwidth scheduling, and plugin compatibility with SmartSync® SmartVideo™ Module. Enterprise Edition has all Professional Edition features with the addition of custom enterprise data workflows integration, FIPS 140-2 compliance, UDP multicast, and plugin compatibility of custom processing of customer specific data. Cost is for annual license. Feature matrix for this product includes, but is not limited to the described features of the product. SmartSync® SmartVideo™ module enables a SmartSync® DCS Server to re-encode a video file to accommodate a lower bandwidth connection, allowing an enterprise to reduce its video delivery costs without quality loss, or to enable video delivery over channels where it would be otherwise unfeasible.SmartSync® supports both H.264 and H.265 standards-based video compression, while producing an average of over 20% bandwidth reduction at equal visual quality over conventional encoders (benchmarked with Xiph Derf video standards HD suite at 6 Mbs target bandwidth). Cost is for annual license. A Professional Edition plugs into a Professional Edition of SmartSync® DCS Server, whereas an Enterprise Edition of SmartSync® DCS Server requires Enterprise Edition of SmartVideo™ module. Feature matrix for this product includes, but is not limited to the described features of the product. 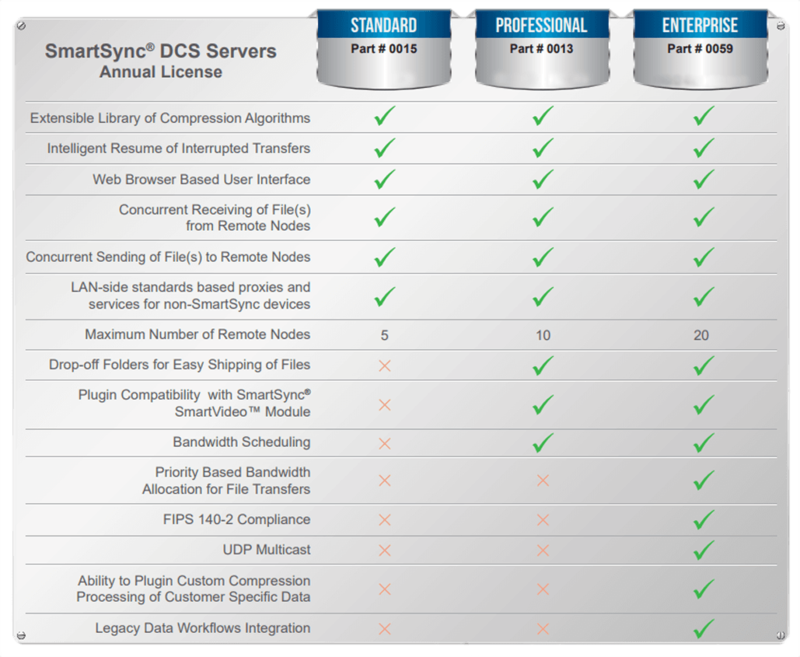 SmartSync® DCS Client provides bandwidth-efficient data distribution using DCS Protocol (over HTTPS, WSS, UDP, ...) with WAN-side SmartSync® Server nodes. Standard Edition features include the manual (user initiated) sending and receiving of files to and from a Server with a license limited to one user. Professional Edition has all features of the Standard Edition but with an expanded use license for a single individual for small-enterprise commercial use. Enterprise Edition has all features of the Professional Edition with the addition of enterprise application in-process integration (e.g. via Java), FIPS 140-2 compliance, and plugin compatibility of custom compression processing of customer specific data. The Enterprise Edition license allows large-enterprise commercial use by a single individual. Cost is for annual license per single-user installation. Feature matrix for this product includes, but is not limited to the described features of the product. SmartSync® DCS Peer provides bandwidth-efficient data distribution using DCS Protocol (over HTTPS, WSS, UDP, ...) with WAN-side DCS Peer and Server nodes. Standard Edition features include the manual (user initiated) sending and receiving of files to and from a Server with a license limited to one user. Professional Edition has all features of the Standard Edition but with an expanded use license for a single individual for small-enterprise commercial use. Enterprise Edition has all features of the Professional Edition with the addition of enterprise application in-process integration (e.g. 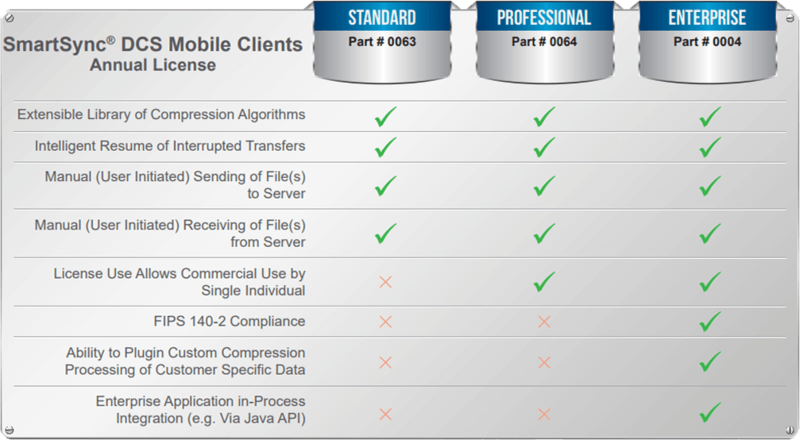 via Java), FIPS 140-2 compliance, and plugin compatibility of custom compression processing of customer specific data. The Enterprise Edition license allows large-enterprise commercial use by a single individual. Cost is for annual license per single-user installation. Feature matrix for this product includes, but is not limited to the described features of the product. 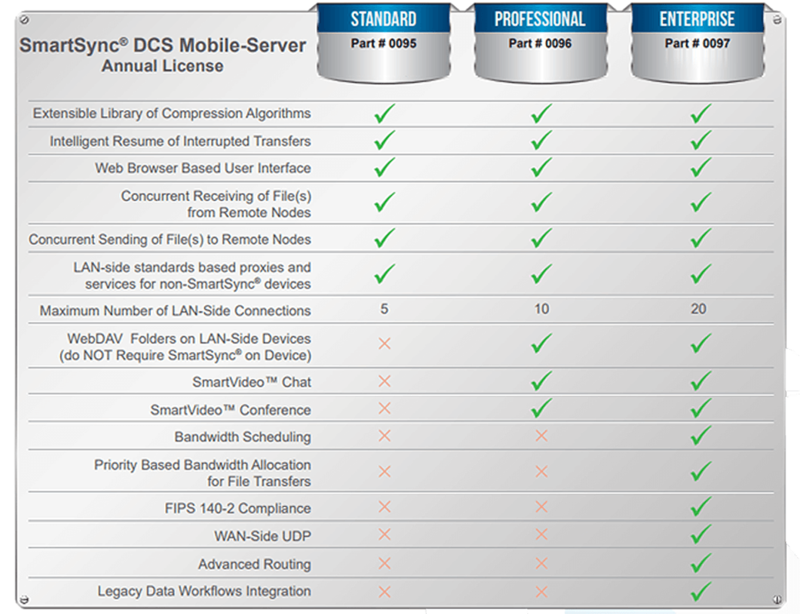 SmartSync® DCS Mobile-Server provides the SmartSync® DCS Server functionality on mobile device platforms such as those of the Mobile-Peer. It has all the capabilities of a Mobile-Peer, but can also provide LAN-level application-layer proxies, such as HTTP-proxy, and services, such as WebDAV-mount of a SmartSync® enabled DCS Cloud Store1 . The Professional edition provides a bandwidth-efficient SOCKS-proxy and a Desktop-GUI interface via HTML5 (in addition to touch-friendly device interface). The Enterprise edition provides for UDP-multicast transport (if supported by the cellular network) and multi-hop forwarding capability for advanced DCS traffic. A Mobile-Server contains all Mobile-Peer and Mobile-Client abilities as well, which means that one can video-chat from a DCS Mobile-Server app to DCS Mobile-Clients, Clients, Mobile-Peers, and Peers on the DCS Network2. Feature matrix for this product includes, but is not limited to the described features of the product. 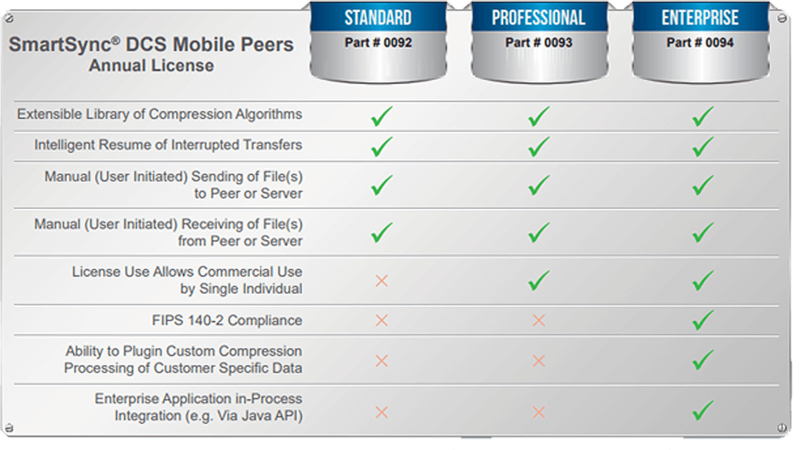 SmartSync® DCS Mobile-Peer provides the SmartSync® DCS Peer functionality on mobile device platforms such as those of the Mobile-Client. It has all the capabilities of a Mobile-Client, but has the added advantage direct connection to other Mobile-Peer or Peer nodes, instead of through a DCS Server. Documents, pictures, and other files, can be synchronized across devices in a peer-to-peer manner. Also, peer-to-peer secure video-chat becomes available with addition of the SmartVideo™ Mobile module. A Mobile-Peer contains all Mobile-Client abilities as well, which means that Client nodes can also connect to a Mobile-Peer via a SmartSync® Server. Feature matrix for this product includes, but is not limited to the described features of the product. SmartSync® DCS Mobile-Client provides the SmartSync® DCS Client functionality on a mobile device platform such as Apple iPhone (iOS), Samsung Galaxy (Android), or Microsoft Lumia (Windows Mobile). A DCS Mobile-Client provides a touch-friendly user-interface to send/receive files, packages, and notes to other DCS Mobile-Client, Client, Mobile-Peer, and Peer nodes via a DCS Server. In addition, a Mobile-Client provides a touch friendly user-interface to video-chat with others, also via a DCS Server. 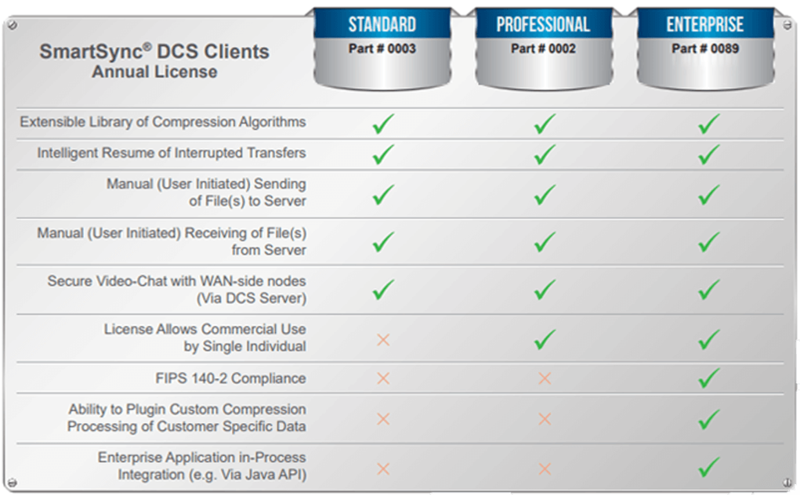 A DCS Mobile-Client only performs battery-friendly and quick compressions. Large data transfers that need heavier compression may be deferred until connected to WiFi, where they can be transferred cheaper on a broadband-WAN to the destination DCS Server. Or, Professional edition of DCS Mobile-Client can “forward” queued-up heavy transfers through an on-LAN DCS Server Pro. This enables “secure, reliable,and efficient video-chat over SATCOM” scenario that otherwise does not work. Because the SmartVideo™encoded video-stream or file is considerably smaller with the same or better quality, a higher quality experience is achievable within allotted bandwidth. 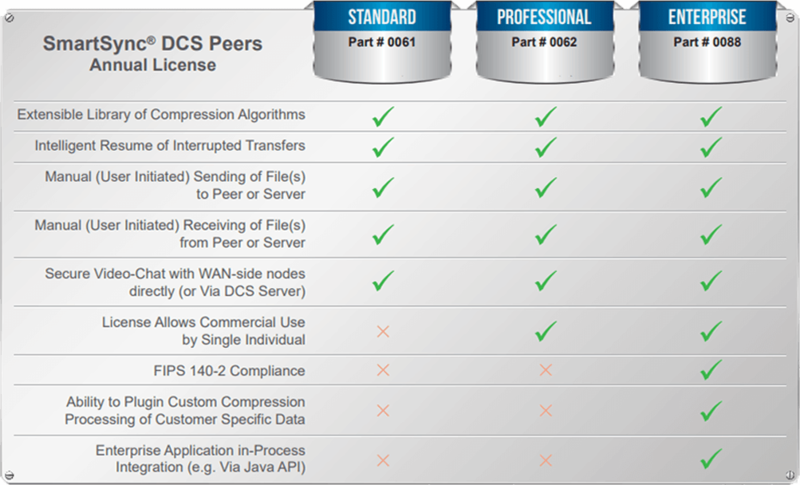 The DCS platform provides for secure transfer and authorized viewing of the stream or file. The Operational Viewpoint (OV-1) diagrams of a few possible usage scenarios are provided in the use cases for this product.